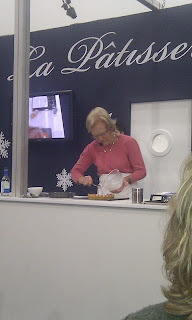 Last Saturday my friend B and I went along to Taste Christmas at the Excel Centre. I've never been to the Excel Centre. Properly, aircraft carrier sized ginormous. After a couple of near-misses when I almost joined the queues for the Britain Got's Talent auditions and the British Olympic Taekwondo try-outs, I finally found Taste Christmas. Lovely. 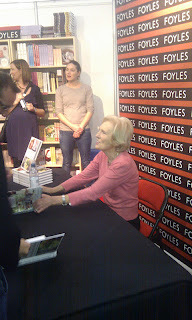 B mentioned that Mary Berry was making a guest appearance, undertaking demonstrations and signing her books. The chance to be within poking distance of the Great Dame of British Baking was too good an opportunity to miss in favour of more free samples of curry. So, dragging B, we sat and patiently waited in the Demonstration Theatre a whole 45 minutes before Mary's appearance. In the front row we sat, like over-eager school children in assembly. And the next half hour was spent in awe of Mary as she demonstrated tips and tricks to make delicious mini brownie cupcakes and a suitably festive mincemeat frangipane tart (both of the recipes can be found on the Taste of Christmas website). To try and stop her sweet-toothed family from eating all her yummy bakes Mary hides them in tins she labels 'dog food'. I'm not entirely sure she was joking. Mary's response? Her Mum's stem ginger treacle traybake, which I decided to make today. And it is yummmmmm-y. Crumbly, a good kick of ginger and warmingly spicy. A little meet-and greet session followed. Guess who was at the front? I can exclusively reveal that yes, this year, Mary Berry will be cooking Christmas dinner for her family. It took a while to recover from the excitement of meeting Mary Berry (THE Mary Berry) and shaking her hand but 'sampling' copious amounts of Russian vodka from a nearby stall did help. And then I discovered Mary Berry was doing a Book Signing session at the Foyles stall. Guess who was first in line? And what did Mary Berry said when she spotted me? I've made a few adjustments to the recipe (sorry Mary Berry) and used 200g of treacle rather than the 225g in the original recipe. Do we think Mary Berry's security people have a photo of me in a folder marked 'Undesirables'? LOL! Lucky you meeting her and you KNOW I love ginger so that tray bake is mine! I'm jealous! 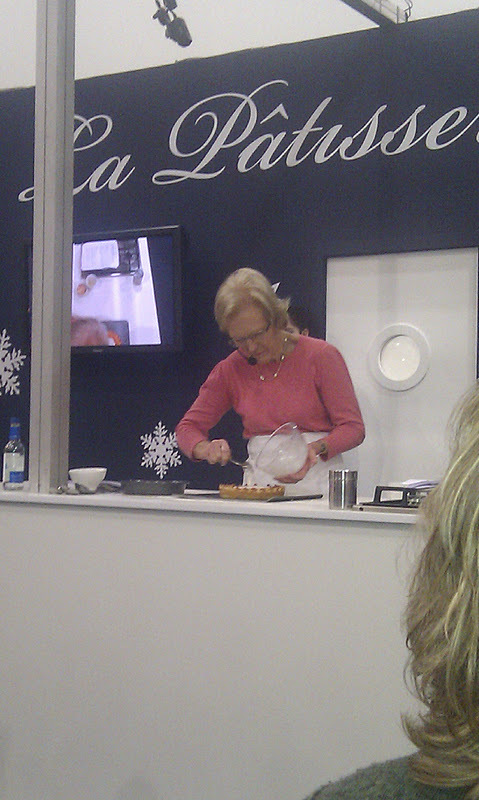 I would love to meet Mary :) I love that you refer to Mary Berry all the way through. Sounds like you had a magnificient day and I agree this cakes looks divine! I would have been up there in the front row with you seeing as it's her ultimate cake book that has been with me for ever and I also LOVE her. Good for you, I bet she was flattered! Sounds like a great day out! I was awed when I met Mary at the Good Food Show and could barely get my name out for the person writing my name on a post-it so Mary could sign my book. I made this traybake recently but didn't try it as I don't like ginger and it was a gift. I like your version with the icing sugar dusting. I wouldn't worry - MB would've known you were merely showing cake love! A ginger treacle traybake is always a joyous thing! It sounds like you had a pretty eventful day! Fun though. I love the look of this treacle-y ginger cake, ginger cakes are some of my favourite cakes so I'm always interested in new recipes. This one is duly bookmarked. Thankyou!